Eclipse: Final *Four-in-Art* Art Quilt | OccasionalPiece--Quilt! Posted on November 1, 2017 by Elizabeth E.
This is the final post of our Four-in-Art Art Quilt group. Sometime later, we added four more quilters, then switched the scheduling to four times a year, so we were still Four-in-Art. We created a blog to post our quilts, for once you archive, you are real. We took turns coming up with the overarching theme for the year, then again, turns for the quarterly challenges. The challenges are, from the upper left: Queen Anne’s Lace, Tree(s), Fire, Owl. It was liberating to craft this way, without getting out too many rulers or drafting things on the computer (see below for a glimpse of my journal). Year 2: Urban Quarterly Challenges (from upper left): Maps, Structure, Landmarks, Contrast, Light (we seem to like this topic). Year 3: Literature — We could choose what segment of literature to focus on. Some did a series of novels, Nancy did a series of children’s books’ titles, which she then donated to her local library, and I did a series of poems. I love the poems, pretty much hate these quilts, for a variety of reasons. Year 4: Color, and the challenges (again, from upper left): Microscopic, Music, Purple Passion, and I’ve Got the Blues. And this year’s, with the yearly theme of Light. The quarterly challenges were: Shimmer, Light in the Darkness, Stained Glass Shadows, and Illumination. It’s very satisfying to notice the growth, the steps backward, the consequence of leaving things to the last minute, and how having enough time impacts what you can create. I also learned new techniques, new ways of doing things, new ways to incorporate design beyond the grid and have it mean something. A few pages from my notebook/sketchbook. It really helped to keep one of these, and not just for the journaling. I was often able to arrive at an idea for my quilt through drawing out (that old mysterious hand-brain connection) and writing out my feelings about the theme and the challenge. Pages about this quilt (the second page is digitally pasted on top of the first). You can see the rejected ideas. This little quilt, Ted and Maurice at Lorinc Pap Ter, is my favorite, not only for the idea of Contrast which it expresses (and was our challenge for this 12″ square quilt), but also because I learned how to print photos onto fabric [making my own photo-ready fabric, not buying it] and had a great time doing this. I have more than one that qualifies for the Least-Favorite-Maybe-Even-Hate, so I won’t tell you which ones. But I can share the why: when I was trying to be too “artsy” and didn’t let the idea drive the design, or when I forced the design, or when I was new at this and just had no clue how to execute the idea. I used to have a dedicated page for all the Four-in-Art quilts, but recently I was cleaning out around here and filed them away in the Master Index to my quilts. Now they are all on the 200 Quilts page, making them easy to find. Slowly I’m going through the posts, adding the tag “Technique” to those pages that show how I tried a new way of doing things, or a new method. I hope they will be helpful for you (use my search engines to the right–Wordpress has outstanding search capability). It’s been a wonderful journey, these past five years, and my hat is off to those who started — and stuck — with me: Rachel and Betty. They were some of the best companions to have alongside me as I traveled this road. Other travelers were Leanne (SheCanQuilt), Anne (SpringLeaf Studios), Amanda, Carla, Jennifer, Nancy (Patchwork Breeze), Simone (Quiltalicious), Susan (PatchworknPlay), and Camilla. Finally, Catherine (Knotted Cotton) and Janine (Rainbow Hare), who were also members, will be carrying this art quilt group forward, through their Endeavorers. Click on their links to be taken to their blogs. And thank you for reading this WHOLE thing. 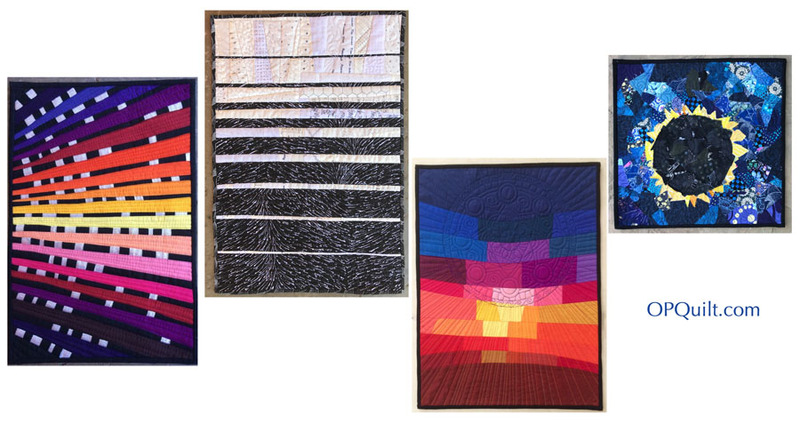 Now, please enjoy the final round of quilts for the Four-in-Art group! 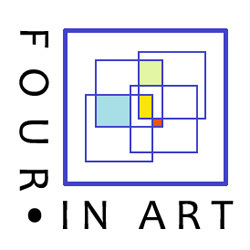 All of our blocks are on our blog, Four-in-Art. I always love seeing these and it’s so cool to see them collected all in one place! I think my favorites are the last two, your stained glass quilt just glows! It was really fun to read about your journey and to see the end results. Your growth through the years is quite noticeable. Well done. As usual, your “teacher” documentation is perfect and will make a great reference tool for you. Wow, love your eclipse quilt, very impressed. Looks like a great group. Enjoyed seeing all the pictures of the different stages of work and all! Sounds like a lot of fun!!! I am so glad you made an eclipse quilt. I know how excited you were about the event. What a fun trip to see all your quilts. I will get my post done in a day or two, then I will have to compare mine to yours. I, too, have some in there I don’t love. I noticed you didn’t say much about this quilt, so I’m wondering how you feel about it. It’s been a wonderful journey doing this with you. Thanks for getting us started. I absolutely agree with Janine about the sense of the drama of an eclipse and that your quilt conveys that feeling of awe – there’s something so amazing, magical and mystical about the presence of the sun, hanging there in the darkness of space. I also think that it captures a feeling of quiet optimism – the sun has gone out, but it will come back! I loved seeing this ‘retrospective’ of your quilts and a glimpse of your notebook – you’ve always taken such a thoughtful approach. I’m so glad to have taken part for a while. How fun to see ALL your art quilts here in this post. My personal favs are Fire from year 1 and Stained Glass from this year. Thanks for sharing them all together. I especially liked seeing your sketchbook too. It’s a piece of art all by itself. I enjoyed my one year with the group and learned about myself in the process so am grateful for the opportunity. I will always remember how I was fascinated by the process you went through to create Ted And Maurice. It’s still my favourite! And your journal is precious! I wish I’d done something like that. Thanks for having me along for the ride. I certainly learned a great deal from it. This is an illuminating piece. I wondered, as I read the title and saw this great quilt, if you had some hidden meaning in it (as Catherine mentioned). The way the yellows appear to give light to the blues closest to it works well. Your portfolio of work from Four-in-Art is a wonderful story for us, as well as you. I have enjoyed the informative posts you write about your projects. Looking forward to seeing where your quilting journey goes from here. Thank you. This is absolutely wonderful! I’m in a pretty new small group, doing some small challenge quilts. Your approach is fascinating, and themes should give us some good ideas. Love your journal, so interesting to see how you work. Thanks for sharing your process! Thanks for sharing all your art quilts. What intrigued me was what your poems were…. Such a stunning way to remember the eclipse from last summer!!! I giggled with delight when I first looked at it, especially since we viewed the eclipse from your backyard. The contrast between your black sun, ring of flames and dark sky are beautiful. I’m looking forward to seeing this one in person. 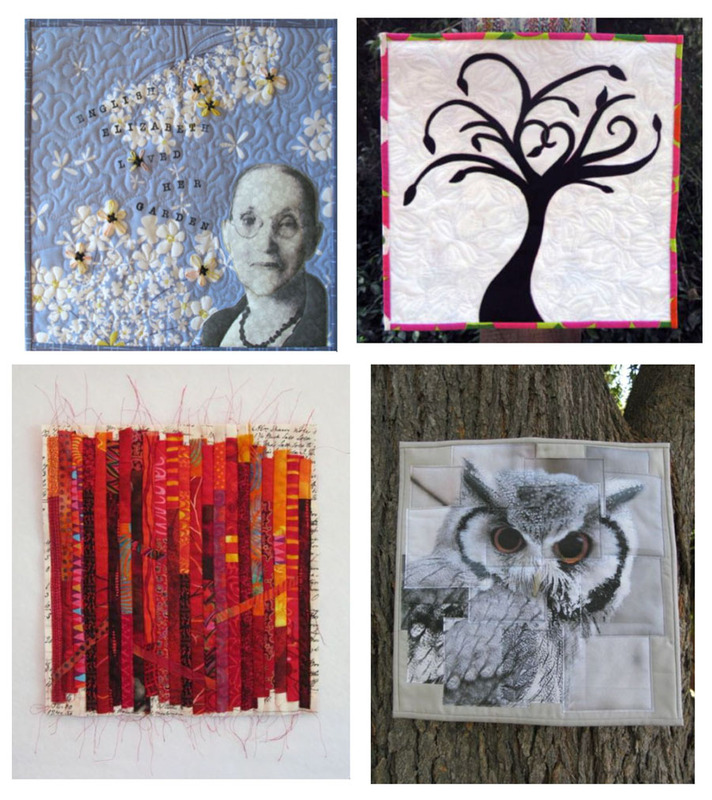 I absolutely love seeing all of your Four In Art quilts in one blog post. Thanks so much for sharing your sketchbook with us too. It’s great to see how your mind works when planning all these projects. Your sketchbook looks packed with all sorts of ideas waiting for their turn at your sewing machine. What a wonderful way to capture the eclipse and to have something, besides the memory, to remind you years from now! And your notebook entries of past art quilts is so you and so perfect. As I said on the blog, you were the muse and it was my great fortune to hear your siren and come running – thank you for these years of Four-in-Art and for your friendship. Cannot wait to see your next big thing! !